Terry, Meg and I first visited Ambergris Caye, Belize, in October, 2003. It was a marvelous trip. We stayed at a small condominium complex, “The Palms”, near the center of town. 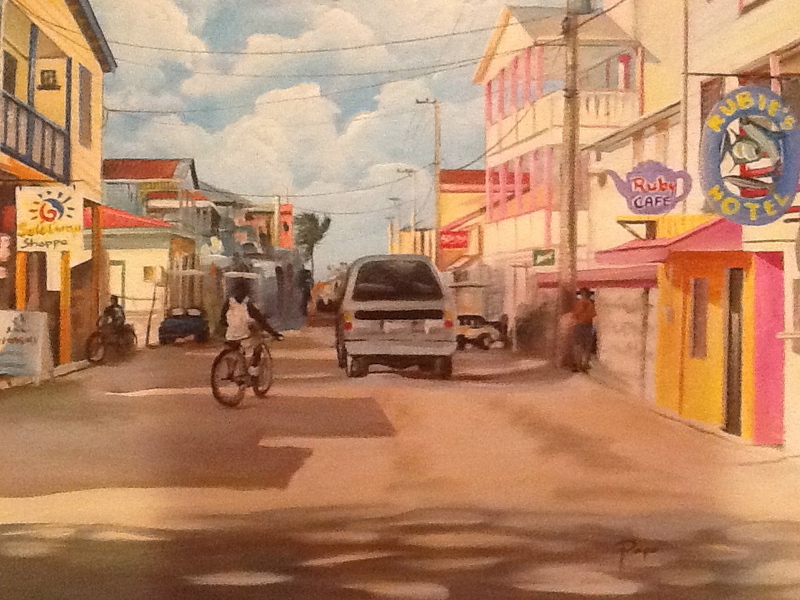 We so loved our experience that we purchased this wonderful, and inexpensive, oil painting depicting the main street running through town. 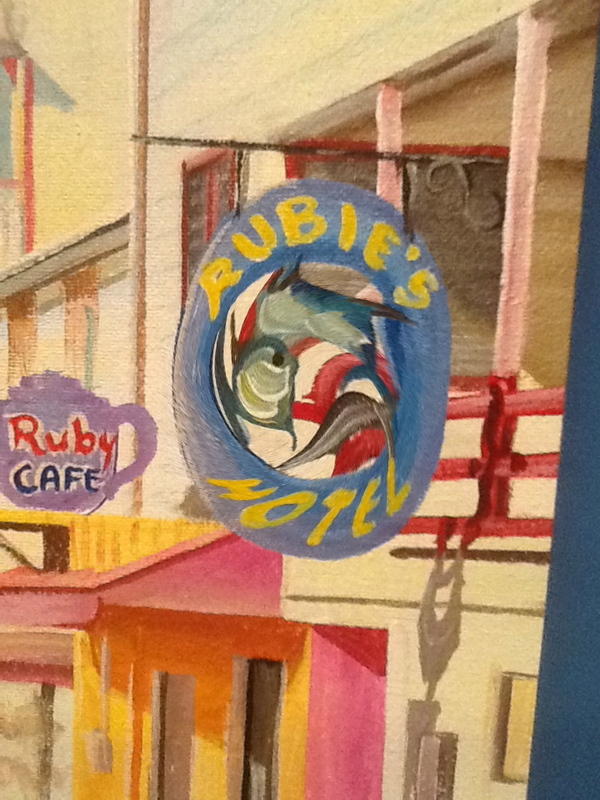 It accurately depicts Rubie’s Hotel and Ruby’s Cafe, (yes, different spellings), as well as the surrounding buildings. Aren’t they fun. If you have a Mac of any sort, give it a try! Happy Saturday. Benjamin Franklin is one of our nation’s most beloved and celebrated founder. Truly a leader of men, he was a diplomat to France, author of the original Poor Richard’s Almanack, authored portions of the Declaration of Independence and was a delegate to the Constitutional Convention. And that is just the beginning of his talents and accomplishments. Noted for both his eloquent descriptions of life and government, he could be witty, pithy and wise. This wonderful sculpture of Franklin, created by George Lundeen,  sits by Latte Land on the Country Club Plaza. Feel free to sit with him for a while. There is plenty of room on the bench. 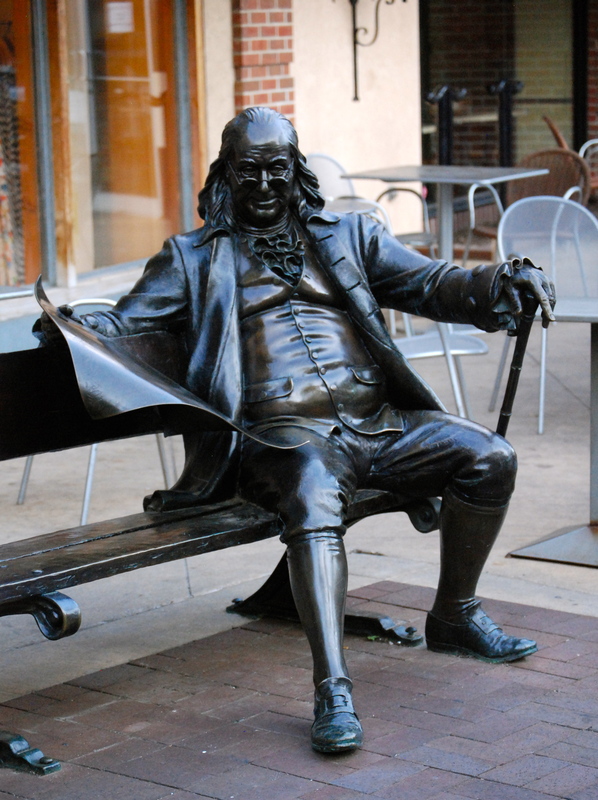 George Lundeen sculpted this wonderful bronze statue of Benjamin Franklin. It is a warm representation of Franklin, one of a series of similar sculptures, large and small. Lundeen’s creations include national heroes, child athletes, newspaper boys, Native Americans and others are charming and seem to capture the spirit of our national character. 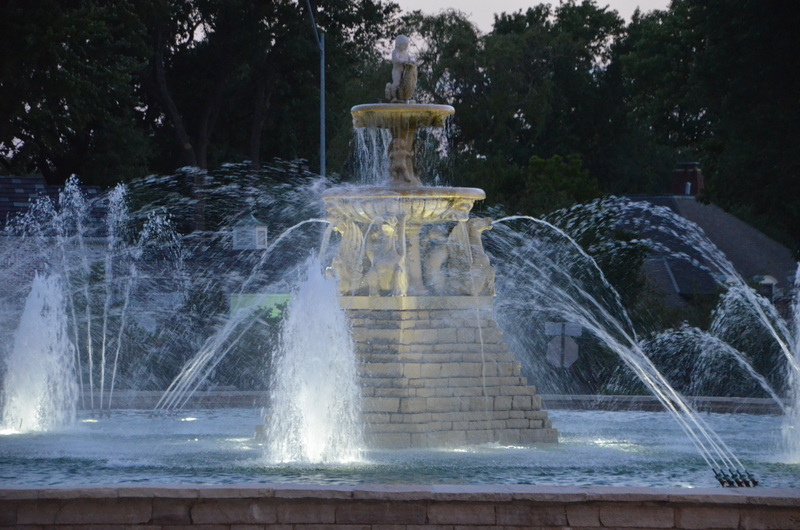 Meyer Circle Fountain is located at Ward Parkway and Meyer Blvd. in Kansas City, Missouri. My old Canon FTb was a wonderful camera. 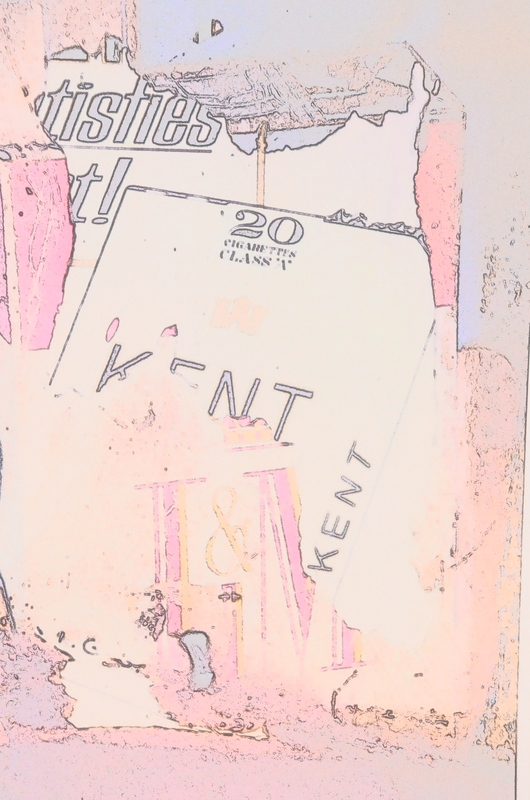 I used it to take this shot of a rusted metal sign advertising Kent cigarettes overlaying an earlier advertisement for L & M cigarettes. 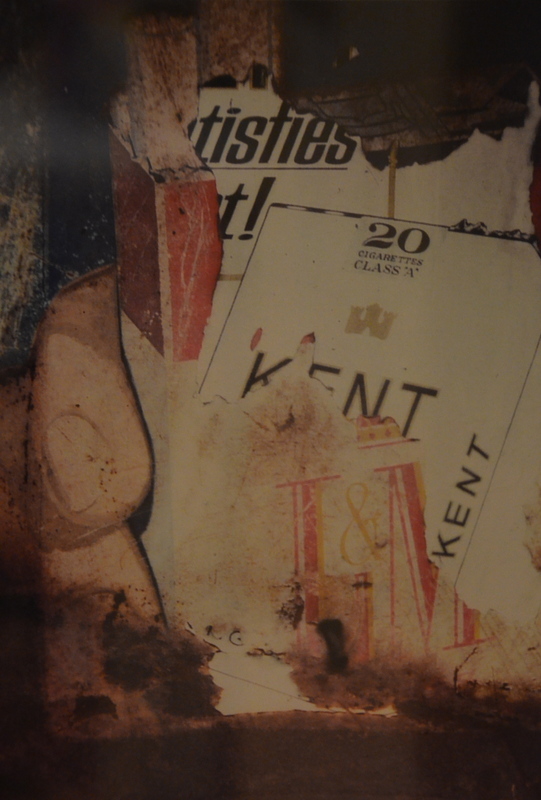 Never a smoker myself I was attracted to the worn, faded image rather than the message. The original photo was taken 35 years ago. 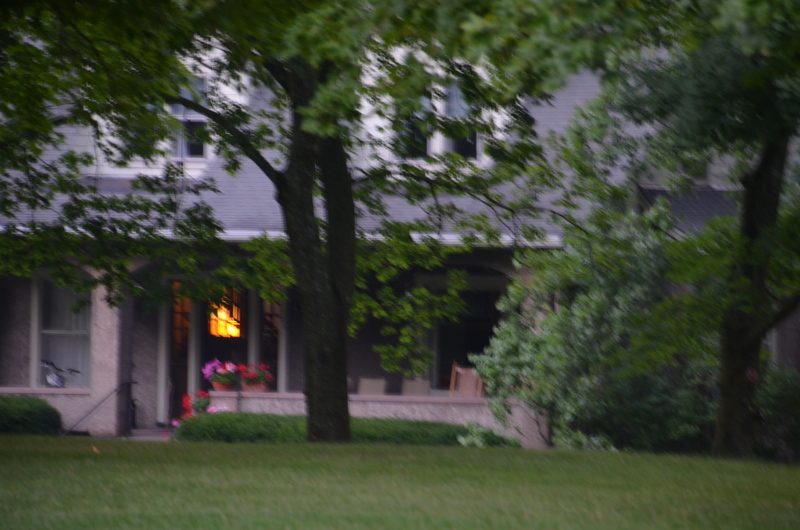 Since I bought my new Nikon D-5100 DSLR I have been struggling to master the camera’s potential. Because this weekend is wonderfully dark and dreary, I have little opportunity for outdoor photography. No complaints here, we’ve needed the rain! But I am anxious to continue to explore, and have fun with, my camera. 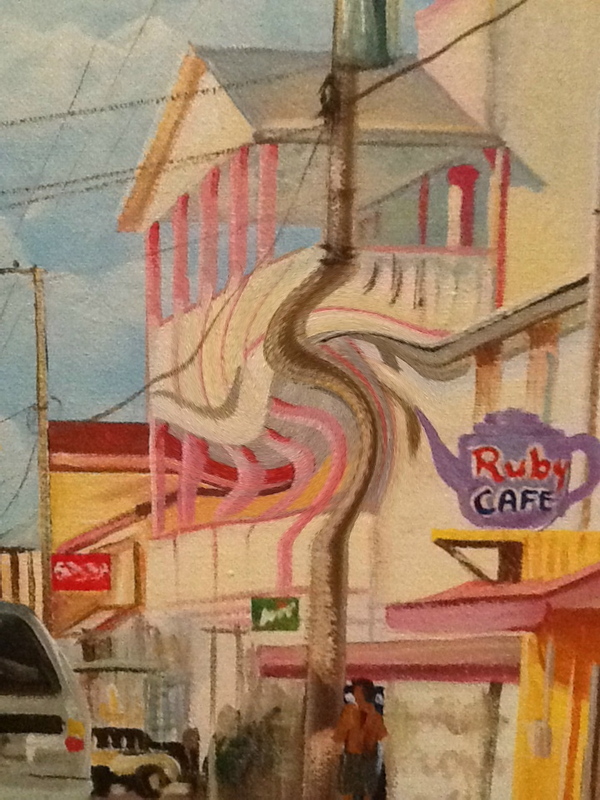 I decided to manipulate the image of this ragged old sign. Here it is. 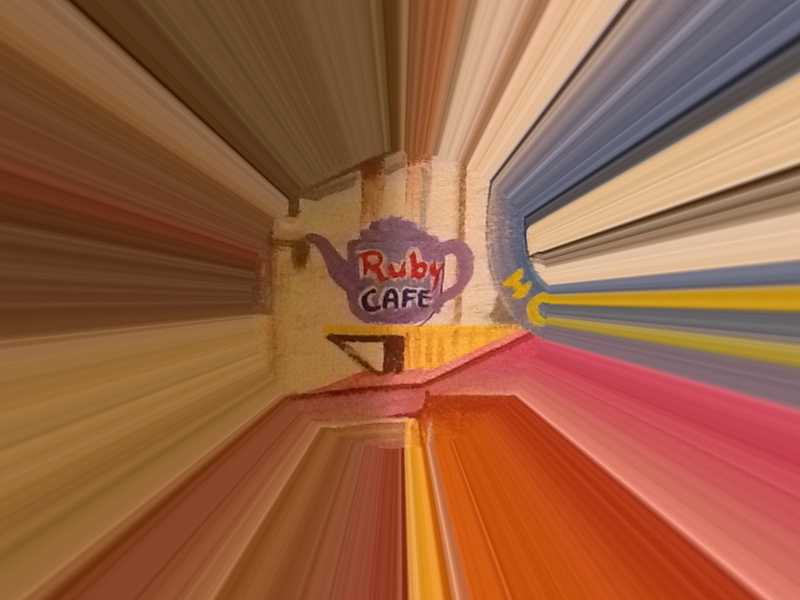 The photograph was taken using he “effects” mode setting on my Nikon, dialed to “color sketch”. “Where giants walked”. Those are the words our tour guide, the curator of the Mansion House in Oneida, New York, used to describe the Oneida Community. 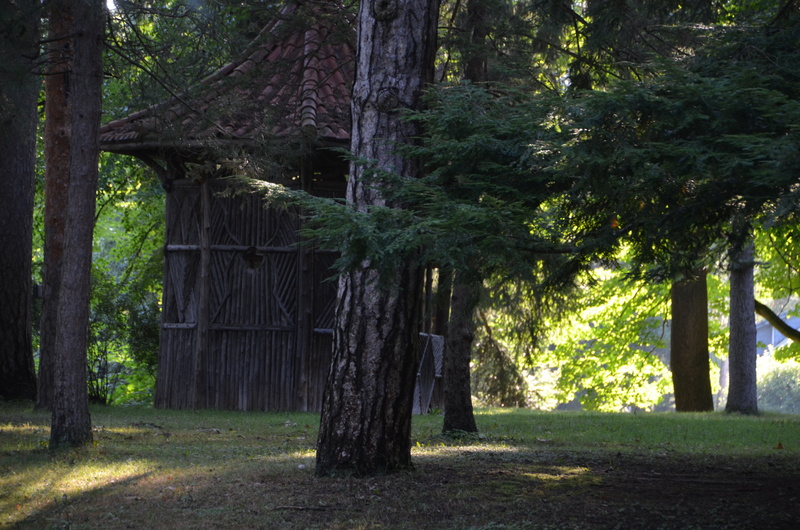 Disbanded more than 120 years ago, the community grounds still emit a feeling both vibrant and tranquil. I didn’t know what to expect when the “cousins trip” arrived in Oneida. What we found far exceeded even my enthusiastic expectations. We spent a night in the Mansion House where our rooms were simple but lovely. The environment was so much more. The Oneida Community was founded in the belief that individuals can become free from sin while still here on earth. Beyond their religious aspirations, their practical reality involved a focus on hard community labor, culture, music, art and literature. These values resonated throughout the community. Beautification of the grounds of the Mansion House and of the surrounding community are evident today. 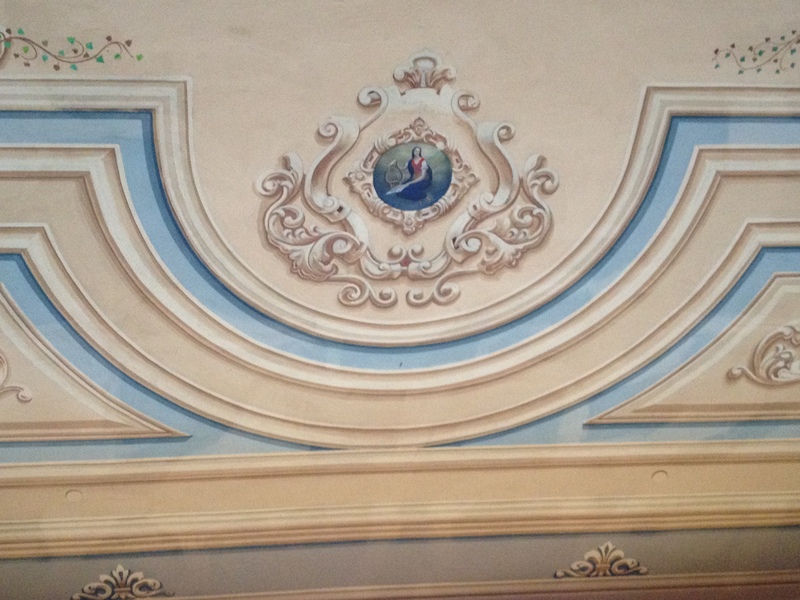 While much of the Mansion House is plain, befitting a society based on de-emphasizing private property, there was an emphasis on beauty of the common areas. The great hall that was a central meeting area demonstrates the community’s commitment to perfection in its culture and art. 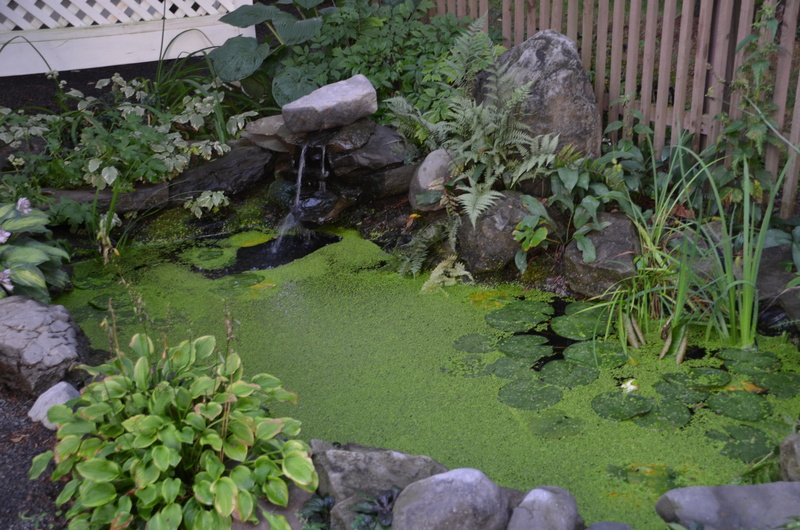 The grounds are lovely, incorporating gardens, simple fountains and open areas surrounded by trees. 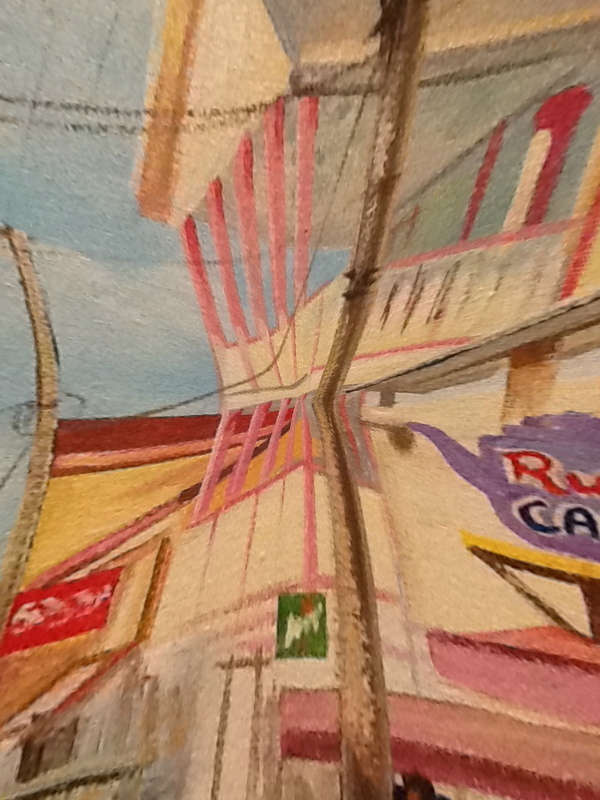 Artistic endeavors were encouraged. 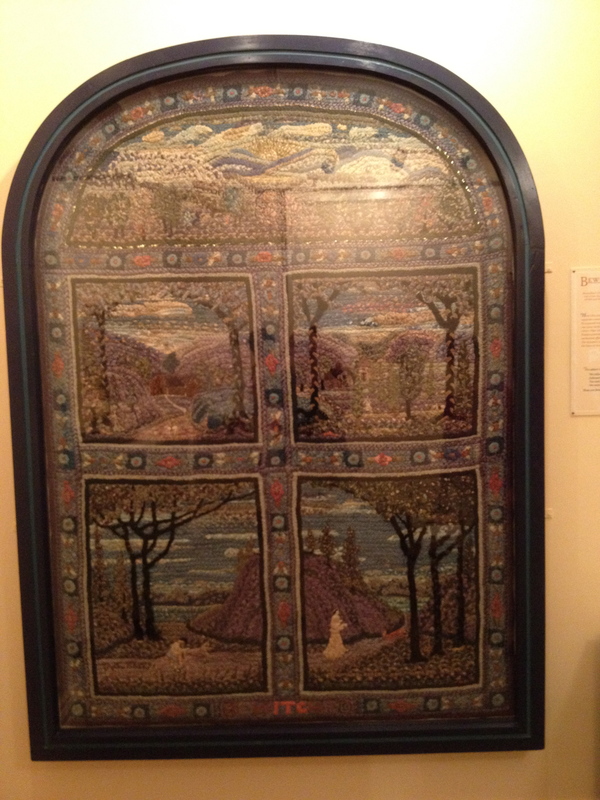 The museum displays beautiful art such as this unique braided rug that are wonderful works of craftsmanship. 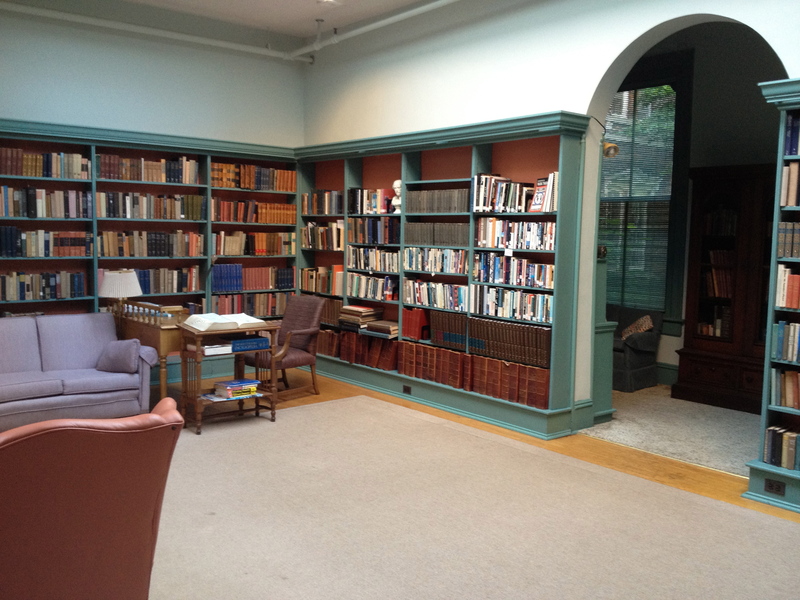 The library was a focal point of daily life, filled with books that were identified as incorporating all of the knowledge important to a learned community. It remains a great place to visit and study. 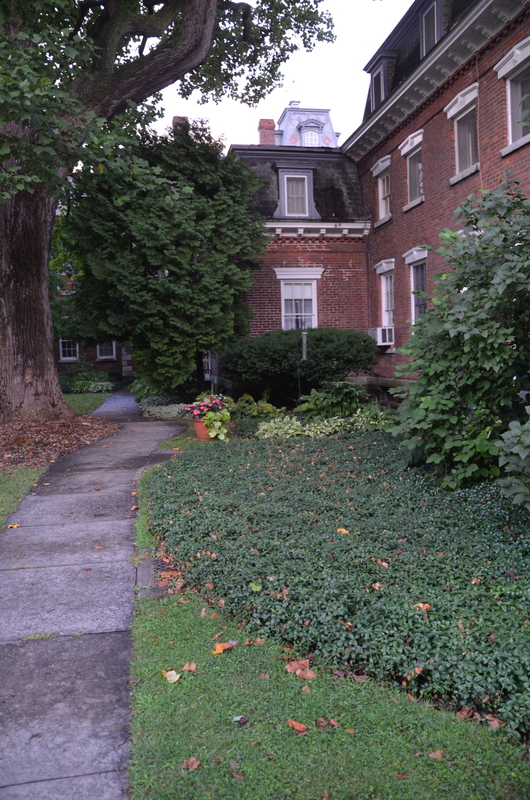 While long disbanded as a religious community, descendants of community members continue to live in the shadow of the Mansion House. While their homes are not elegant, they are as graceful, well-groomed and inviting as the people who live there.